In Nigeria, the current digital Tax Clearance Certificate (TCC) Sample is as attached below. Whether you are a corporate body (company) or an individual, you need Tax Clearance Certificate (TCC) in Nigeria. But before you can be issued tax clearance certificate, you must have rendered your tax returns to the relevant FIRS or states author as the case may be. Below is a current Tax Clearance Certificate (TCC) Sample issued by Federal Inland Revenue Service. 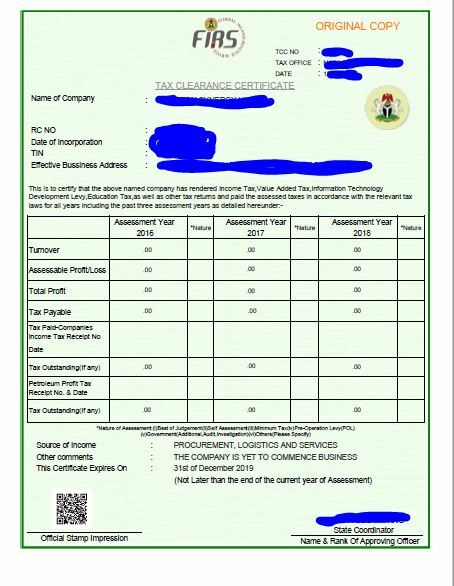 The essence of this post is to help people to see how the current Tax Clearance Certificate in Nigeria looks like. Currently, Tax Clearance Certificate is very easy to verify online without much assistance. To verify your Company TIN and Tax Clearance Certificate online.